Traditions at Lake Ruby is a great 55+ community located in Winter Haven, Florida. Those looking to purchase a low-maintenance home in this neighborhood can choose from both resale and new construction homes. Residents of Traditions at Lake Ruby enjoy a clubhouse with well-appointed amenities to keep them socially and physically active. Situated in Central Florida, the area surrounding the community offers numerous daily conveniences such as grocery stores, pharmacies and shopping malls. Residents of Traditions at Lake Ruby enjoy resort-style amenities both inside and outside of the 19,000 square-foot clubhouse. Inside, there is a card room, library, billiards, arts and crafts studio, and ballroom. A fitness center and aerobics studio are perfect for those who want to stay in shape. The amenities continue outside with a resort-style pool and spa, two tennis courts, three bocce ball courts, two shuffleboard courts and a half basketball court. This community is unique in that it sits on the banks of the scenic Lake Ruby and offers a lakeside gazebo and dock slips for residents with smaller boats. Beautiful walking and biking trails round out the amenities at this 55+ community. Started in 2005, Traditions at Lake Ruby will offer 552 single-family homes upon completion. Homebuyers can choose from two low-maintenance collections. The Estates Collection offers five floor plans ranging from 1,582 to 2,032 square feet of living space. Each model has at least two bedrooms, two bathrooms, and an attached two-car garage. Some of these models have dens which make great home offices or entertainment rooms. The Executive Collection offers five models ranging from 1,779 to 2,599 square feet of living space. These models offer two to four bedrooms, two to three bathrooms, and an attached two to three-car garage. All homes in the community were designed with active adults in mind offering open floor plans and low-maintenance exteriors. These homes are available on a resale-only basis. Active adults living in Traditions at Lake Ruby enjoy an social lifestyle with a calendar full of clubs and activities. Homeowners who are looking for fun can attend any number of the community clubs such as card club or book club. Community holiday parties are a favorite among residents and bring all the neighbors together to celebrate. An annual homeowners' association fee covers general maintenance of the community grounds and amenities as well as the lawn care and trash removal of all homes. This allows residents to relax with friends and family while enjoying old hobbies and discovering new ones. Located in Central Florida, Traditions at Lake Ruby is conveniently situated close to great entertainment and recreational opportunities. The surrounding area is known for its numerous freshwater lakes, which offer excellent boating, fishing, and other water sports. Travel to other parts of Florida is also a breeze as the community is close to major highways such as Interstate 4. 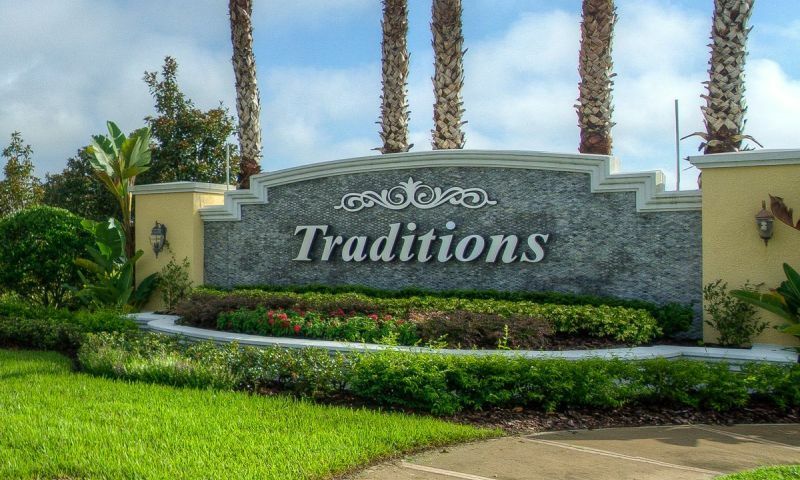 Those looking for well-built homes inside a gated community with great amenities should look no further than Traditions at Lake Ruby in Winter Haven, Florida. There are plenty of activities available in Traditions at Lake Ruby. Here is a sample of some of the clubs, activities and classes offered here. The Estates Collection offers single-family homes ranging from 1,582 to 2,032 square feet of living space. They have two to four bedrooms, two or three bathrooms, and an attached two-car garage. Some of these models have dens which make great home offices or entertainment rooms. These homes are available as new and resale. The Executive Collection offers five models ranging from 1,779 to 2,599 square feet of living space. These models offer two to four bedrooms, two or three bathrooms, and an attached two or three-car garage. These homes are available on a resale-only basis. Our home is being constructed as I speak. My wife and I will be moving from Michigan to Florida in December. We have met a few some of our neighbors and all seem to be very friendly. Phillip has been a big help keeping us informed on the updates of the construction process. We cant wait to meet our new neighbors on Bedford Ave. Supposedly this is suppose to be an adult community. You would not know it if you went to the pool in the afternoon. It is filled with kids and inner tubes misbehaving and running around. They are taking up the pool and there is no room for us to enjoy the pool so we have to leave. What are we paying for the HOA fees for? This community is well maintained and looks nice all the time. It is nice to not have to do yard work. On the down side, a lot of the residents have lived here a long time and are clickish at dances and other socials. It causes the new residents to feel like they do not fit in. I am not the only one that feels this way. I have talked to other new residents that feel the same way. They play Bunco once a month and that is a lot of fun. We have been told that the clubhouse ballroom is not big enough for all the socials. My husband and I have found some where else to socialize with people our age and we have seen other Traditions Residents there. Purchased in November and given a completion date of May. Home completed May 5th. Given updates during construction and satisfied with the building process and timeline. Sales were polite and professional giving us all the information to purchase and complete the sale with no outstanding questions or issues. Construction on site manager and construction VP were all quick to return my calls and address my concerns and questions. My home is finished and there is construction on both sides of my home. I do not have any complaints about the time of construction or the noise from the sites. I have not been disturbed by any workers or machinery. We purchased this home to relax and enjoy ourselves and I know we will accomplish both. We have lived here since the development first opened and are more than satisfied with this wonderful community. There are so many amenities and wonderful activities throughout the year. The staff is outstanding and always try to accommodate the community. Thank you Lennar for being responsible for this wonderful community! 55places.com is not affiliated with the developer(s) or homeowners association of Traditions at Lake Ruby. The information you submit is distributed to a 55places.com Partner Agent, who is a licensed real estate agent. The information regarding Traditions at Lake Ruby has not been verified or approved by the developer or homeowners association. Please verify all information prior to purchasing. 55places.com is not responsible for any errors regarding the information displayed on this website.